Newly emerged Irish Lady’s Tress at Lough Allen. This is the best specimen and best photograph this year with great detail visible in full size image. 2. Liaising with local Landowners and National Authorities. 4. Undertaking our usual comprehensive survey of Lough Allen plus expanding to many other suitable lakes in the Connaught region. Here we report on numbers for Lough Allen in 2014. Map of distribution is being prepared but townlands are given below. At time of writing we now have 43 specimens on Lough Allen, more than last year. Spiranthes romanzoffiana appeared early and the numbers increased slowly this year. Specimens that flowered last year were the first to flower again this year. For the first time we have established study specimens (4) and from these we now know that flowers that were undamaged last year will flower again, maintain leaves above ground all through the winter, and (thereby?) produce a new bloom earlier. 50% of studies specimens have gone on to bud again. First new specimens were seen on the 6th July which is the earliest they have ever been recorded in Lough Allen. They were 7 in number (including the 4 study specimens.) After that there was a hiatus with no new specimens emerging (or being observed) for 11 days. However, recent warm weather with showers promised well for new emergent specimens — and so it transpired. There is a regular pattern of plants now being found as good sized flowering specimens on a shore that we had surveyed a week to 10 days previously. It is easy miss a small emerging specimen but to miss many is unlikely. We suspect that some Spiranthes given the right conditions (warm humid weather?) can emerge and put on a ‘good show’ within a week. This is different behaviour to pre-existing flowering plants developing during colder weather and budding as far back as May! Also specimens have been occurring in areas where they have not been seen for several years. This testifies to the durability of the species, poses interesting possibilities as to ‘where they are coming from’, and makes surveying work that much more exciting. We can never assume that Spiranthes may be gone from an area. It can come back! Whether this is dues to dormancy and an old enlarged root having survived underground, or new seeds arriving in the wind from the West or, even, America... We simply do not know.? So, LOOK everywhere. The conditions these plants like are a southwest facing shore. They are always near (or in) water and will survive being flooded deeply over a long period but their flowers are always produced out of water though they may later become flooded. 1. Bare sand with raised up grassy mounds. 2. Rocky shores with pockets of vegetation and often Alder scrub. 3. Open and exposed grassy or muddy shores with no boulders. 4. Good or poor meadows, actively grazed or with Alder bushes sprinkled through them, or raised rough meadows on old bog. Always near water and flooded at some stages. 5. Finally, east shores but not exclusively. They either like the evening sun or are blown there as seeds. It is a strong bias. Locations surveyed include Derintobber, Holly Island, The Spit, Kilgarriff, Annagh Lake, Rossmore, Gubcormongan, Druminalass, Yellow River and Shannon River inflow (east side). Specimens have been recorded to date from the first 6 of these sites. Much suitable habitat occurs both in the unsuccessful sites (listed) and other areas not visited recently. Though less regular on the west shore they have occurred in good numbers here in the past. The reason for their absence is debatable. It is an important conservation issue for Ireland that this species be accurately recorded and whatever can be done to protect the species should be done. At this time of year the most useful work that can de done is walk the shores and look out for the bright white flowers that often stand out well or also may hide between boulders or under Alder trees. This is a species protected by the Wildlife Act so please do not pick them. They are great fascinating objects to study and photograph and we would be very grateful for any new finds from anywhere around the Lake including the sites mentioned above but especially from the west shore and localised pockets of suitable habitat that you know! Our Contact Details are on the HOME page. LEFT: Best Specimen from 2013. A strong healthy plant with a large spike growing near Drumshanbo. As of today (14th. 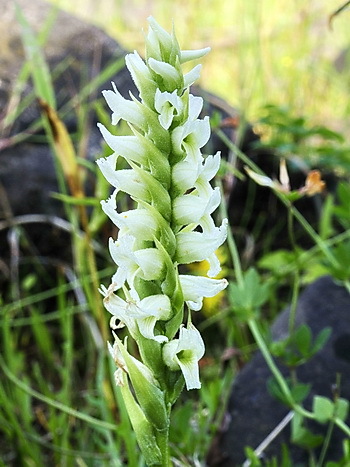 August 2013) Spiranthes have emerged in 4 sites and 34 specimens. However, apart from the southeast site, where they are doing quite well in their recovery, numbers are down. Northern and western sites have been a disaster and the species in Lough Allen is now largely dependent on one large site near Drumshanbo. By their nature, things may be different next year, but it does seem that now is the time to put in protection measures attractive to the Landowners. Initial emergence was rapid and promised well for the season but quickly slowed down. Rate of new records is much lower now than in previous years. Reasons are possibly many... the vagaries of the species, cold wet winter, recent long hot spell, etc. One good ‘new’ site in 2010 has failed this year and was down from 12 in 2011 to 4 in 2012. This is a largely rocky shoreline but there are donkeys present in the last couple of years. Unfortunately grazing pressure has been a problem this year where it was previously something we could almost disregard. Most experts decree that grazing of sites where Spiranthes occurs is mandatory, i.e. in sites that carry heavy vegetation need to have this reduced in early Summer. Spiranthes does also occur on almost bare mudflats and in between boulders on rocky shorelines. Normally we can expect a flower that emerges to mature and wither. This year in an important site at the north end of the Lough, specimens disappeared within days. This pressure on grazing probably does reflect our long poor Winter/Spring. If Spiranthes is to survive in Lough Allen provision and funding needs to be made to protect certain areas during the Summer. However, the southeast site still remains and 1 hardy specimen has emerged on Holly Island where inadvertant damage was done to their habitat in 2010. We acknowledge and appreciate the work done to secure this site and allow fishing and botany to co-exist. Hopefully the Spiranthes will respond appropriately! This is just a temporary report. Half the season has yet to run... However, many local and International visitors have responded to this Website and have come to visit our unique plant this year. More on this story ANON! The TOTAL ended up at 34 for 2013. Number could have been higher but increasing onshore grazing is reducing habitat available for this species. However many landowners are keen to help with conservation of this species and we are preparing a Spiranthes Conservation initiative. 2012: Plants are appearing north and south of the Lake! UPDATE: 20th August 2012... 30 flowering specimens! We are getting close to finalising our Spiranthes Count for this year. All the eastern shore and most of the northern shore has been surveyed. All know sites have been visited on several occasions by us and by some very experienced Botanists. We were pleased to be able to introduce some reasonable plants to some English botanists who havn’t met this species before! The fact that Spiranthes has returned to the south east corner but not the south west corner does suggest that the damage done at Holly Island and the wanton use of vehicles on that shore may be contributing to the elimination of this protected species in that area. Other sites on the west shore are now overgrown and do not seem sutiable for Spiranthes at present. That, and the absence of the species from the only site on the east shore that has changed in recent years (Kilgarriff) does emphasise this species susceptability to inadvertant land use change. We have sought to build relationships and discreetly make people aware of the rarity of this plant — and have received much sympathy towards nature among all we have talked to. PLEASE CONTACT US IF YOU SEE THIS PLANT? See 2012 Distribution Map below. 2011: Survey results shown below. Photographs like these are one of our strongest tools in trying to protect the Environment from any unwanted development! We would be very grateful if anyone finding these Orchids, particularly in the southern half of the lake, would inform us (086 3900731) or by eMail). Irish Lady’s Tresses are an exceedingly rare species protected by EU and Irish Law. The Flora Protection Act prevents them being picked or willfully damaged. It is species like this and the Curlews and Mergansers that make the Lough Allen environment unique and will guarantee its protection for future generations. 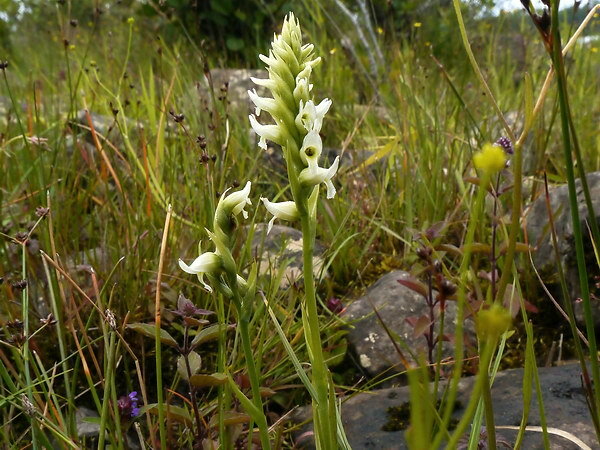 Lough Allen’s extremely rare orchid has lost ground over the last 3 years and is showing a worrying trend to occur in fewer sites, thus becoming more exposed to risks. This plant is a major component of Lough Alllen’s powerful biodiversity — it would be a shame to lose it. 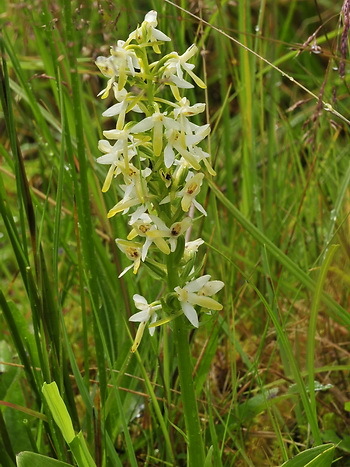 There are 2 pure white flowered orchids that can be found around Lough Allen. 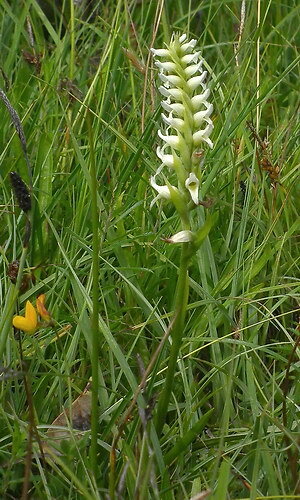 One, the Lesser Butterfly Orchid is flowering now (June/July). 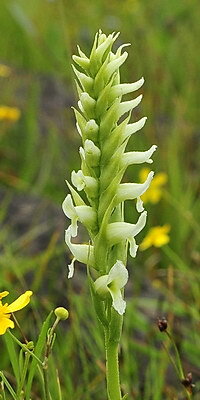 The other, Irish Lady’s Tresses, is the rare one, and flowers in July/August. From a distance, and superficially, they may appear alike. They both can appear as small white spikes half buried in grass or rushes. This one (on the Right) is the Butterfly Orchid and it occurs in sloping, often south facing, pastures well above the lake shore. These 2 photographs (Left) are of Spiranthes romanzoffiana — Irish Lady’s Tresses — restricted to lake shores (and so far, in this area, only Lough Alllen’s shore). It occurs within a narrow band between high and low water levels. If you see any of these orchids along the shoreline we would be very pleased to hear about them. Also, please do not pick them; they are a protected species! They are just starting to flower now as we write! Please feel free to CONTACT US for more information or if you have sightings to give us. It’s important that the whole lake’s distribution be recorded so we can monitor any change in populations of this extraordinarily rare species. Close-ups of the flowers of the 2 species. 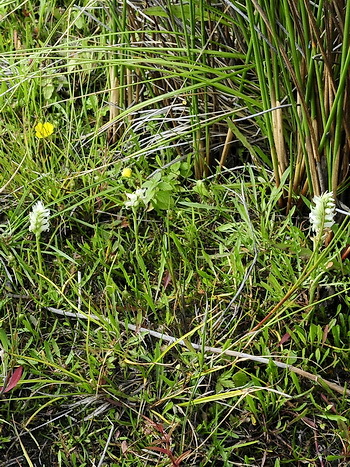 The Spiranthes (Lady’s Tresses) is shown on the left. It often has a spiral flower and this characteristic of the species gives it its technical name — literally meaning ‘spiral flower’. 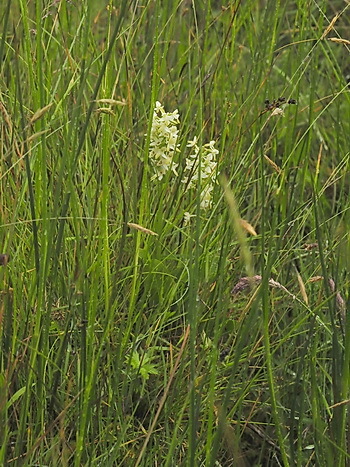 It is a very pearly white with a touch of green whereas the Lesser Butterfly Orchid flower (on Right) is yellower in colour. 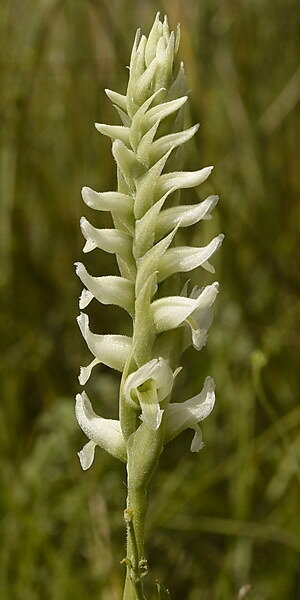 Also the structure of the latter is very open and does not show the twisted appearance of the Spiranthes. The long ‘spur’ typical of the Butterfly orchid can also be seen behind several of the individual flowers in the photograph on the right. We, at LoughAllenBasin.com, believe that it is crucial that this regionally very unique habitat be allowed to continue to thrive. Many orchids are very well represented at Lough Allen but the Irish Lady’s Tresses is both quite unique, very beautiful, and possibly vulnerable. How to save this rare plant? 1. Take care while walking along many shores of the lake. Look out for them as you go. 2. Will not be found in dense vegetation but happy on stoney, muddy, grassy shores but always very near the lake medial water level. 3. Grazing of the shoreline is no harm but excavation or boulder clearance on the shoreline may damage them. 5. Do not pick them; they are a protected species. 6. It is good to allow genuine people come and see something rare and special; try to avoid squashing them though! We are often amazed about how considerate people often can be! We (unlike the Spiranthes) are not natives of these parts. But it is home and we have come to appreciate the unique Flora and Fauna that Lough Allen has. It has become our pleasure, in our free time, to explore and record this Biodiversity. This work should be valuable in years to come but it would not be possible without the support and kindness shown to us by people all around the Lake. If we ever, in moments of haste or panic, seem bothered or hurried... please forgive us and accept our appreciation for allowing us to study and record these unique gems! The Spiranthes is only one of many Gems! We have a checklist of the Top Dozen Spectacular Species in our 2010 Brochure, which you can read HERE! Finally... if any of you would be interested in seeing these rare Orchids, up until the middle of August, we would be happy to try and arrange this for you in association with the local Landowner. Some years they are spectacular; other years they may only barely survive. It depends a lot on the weather. CLICK on an Image below to go to a larger versions of the photograph (900 x 1200). ...if you see one of these anywhere around Lough Allen (or the North West), we would be very glad to hear from you!